Student employment is an important part of the college experience. Residence Life at UWGB employs many students in a variety of different positions that will provide students with the opportunity to gain skills that will be used both during their time in college and after they graduate from the university. 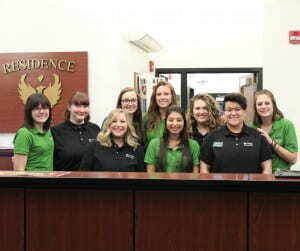 A quick visit to the Residence Life Student Employment page will reveal that there are a variety of student employment opportunities that are available to students at UW-Green Bay. Each position offers different tasks and experiences which also promote learning outside of the classroom. What a visit to the employment page will not reveal directly are the other invaluable reasons that students should apply for a student employment experience in Residence Life. Student employees are first and foremost students. As an employer, we understand this. Our focus is on our student employees’ academic success. This starts at the beginning of the semester by ensuring that a work schedule does not interfere with your student’s class schedule. It occurs during regular conversations, some formal and some casual, where a staff member will ask, “How are you classes going?” Each semester our department also asks students to complete a mid-semester grade check for most positions. This encourages the student to connect with their professors to receive an assessment of how they are doing. These connections can often make the difference on the pathway to academic success. One of the core values that we take very seriously in Residence Life is the mentorship. As a department, we maintain an intentional focus on building relationships with the students that reside on campus but the students that work for us receive the benefit of having that interaction on a daily basis. Our staff, from our custodians all the way up to the director, take the time to ask, “How are you doing today?” We make sure that our student employees know that they have an on-campus resource available to ask questions. We are invested in their success and in building relationships that last through their time at UWGB and often long after. While teamwork may not always seem like a benefit, learning how to communicate and operate with others to accomplish a task is one of the most important transferrable skills a student employee will master during employment with our department. Nearly all of our student employment positions offer the opportunity to operate as part of a larger team. In some areas, like being a Resident Assistant, your student would work directly with other RAs in their building and area to ensure that their communities remain safe and fun environments to learn and grow. As we begin this spring semester, Residence Life will be recruiting for summer and 2019-20 student employment positions. More information is available on the Student Employment Page. Encourage your student to apply today to take advantage of the great experience and benefits that student employment offers!